While I was pondering these things I did enjoy the time at home. My kids were 3 years old and 2 years old and it was the most time I was able to share with them to that point. Plus they had no idea what was going on. They just knew daddy was around more often. The support at home was great. I also had great support from friends and colleagues. One person in particular who was very supportive and helpful was my good friend Dave Leitao. At the time Dave was the Head Coach at Depaul where he was building a successful program. Dave is a super cool cat and a really good listener. He also could relate to my disappointment because he had been through a tough professional experience of his own. Now he was flourishing. In fact, he was flourishing at such a level that he eventually revealed in our conversations that he was going to be offered the Head Coaching job at the University of Virginia. This was Big time stuff and although he did talk about his impending decision, Dave often had a way of talking about major things in an understated manner. At some point in our discussions Dave suggested that he was leaning towards taking the Virginia job and suggested that if I were willing to come with him it would strengthen his conviction about the move. I’m sure his mind was made up but it was good to feel wanted and I’m certain Dave understood that. By this time, I was very fortunate to have had several opportunities to consider but the only situation I was excited about was the possibility of working with Dave at Virginia. I had always admired him and consider him a friend. Smooth transition. I got off the canvas, we packed up and moved to Charlottesville, VA: Great town, great people and simply a special place to work and raise a family. Dave did a tremendous job in our first year of creating the culture he wanted and we had a solid, unspectacular year with an undermanned team qualifying for the 2006 NIT. 2006 was the year that the Florida Gators won their first of back to back National titles. Success of that level creates opportunity and that year longtime Florida assistant, Anthony Grant was handed the reigns at Virginia Commonwealth University. Through a very close mutual friend, Florida Head Coach Billy Donovan and I had known each other in passing for quite a few years. That friend, Ryan Ford, had been Billy’s college teammate and best friend and he had also served as a groomsman in my wedding. Ryan is such a good friend that I actually aspire to be the person he thinks I am. So unbeknownst to me, as the possibility of Anthony Grant leaving Florida to go to VCU arose, Ryan was planting seeds with Billy about me becoming Anthony’s replacement. Sure enough Billy and I began discussing the position and before too long he had offered me the job to join a program that had basically all of the key players from a National Championship team returning. Billy and I were both out in Texas for the Kingwood Classic which used to be one of the biggest recruiting events on the Spring circuit. We sat in his room at the Marriott and, as hard as it was to say no to this dude, I turned down the job and decided to stay at Virginia. As I would learn later, Billy Donovan takes a lot of things in stride. He certainly took this moment in stride and made a comment to the effect that he respected my reasoning and believed we will get another chance to work together someday. What did I just do? I wasn’t sure what turning that job down really meant but I understood why I did it. Dave hired me and gave me an opportunity when I was at the lowest point of my career. He asked me to come and help him build his program. So, after just one year as we are trying to establish the foundation of the program, to jump ship for greener pastures didn’t feel right. I felt like I owed him more than that. So I stayed. Although Florida went on to win another championship in 2007 I had no regrets at all. We had a successful year in our own right at Virginia, winning the regular season ACC title and Dave being named ACC Coach of the Year. We earned a no #4 seed and advanced to the Second round of the NCAA tournament. It wasn’t a National Championship but I was definitely cool with that. Well, with success comes opportunity and once again Billy had an assistant coach leave to take a head coaching job. Long time Florida Assistant, Donnie Jones, had been named head coach at Marshall University. So here we go again. Sure enough, Ryan Ford was working Billy again and we were right back where we left off the previous year. At this point my wife, Dayo, and I are thinking that Billy Donovan is the hottest coach in the nation and can hire just about anyone. We felt that we had to at least position ourselves to go see everything in person before we made a decision. So we did that and after visiting Gainesville, Florida and spending time around the program, the University and the people it would have been difficult to say no to this opportunity a second time. As difficult as it was to break the news to Dave that we were leaving, we did and him being a true pro, he handled it like a big brother; disappointed but supportive. I’m not exactly sure how much time passed between the moment I accepted the position at Florida and when I actually went down to Gainesville but I do recall that I got into town on a Sunday and moved into an old Residence Inn (they’ve since built a new one but this one needed some work). I was able to get into the office on Monday and Tuesday to start settling into my new space and getting acquainted with the people and the surroundings. Me: “Ok, Cool I’m on my way”. I thought it was strange. Weekday afternoon impromptu meeting at the bosses house? But ok.
After a few more comments from others on the staff Billy proceeded to pick up the phone and call the GM of the Magic at the time, Otis Smith and accepted the job while we were all in the room. It was actually pretty cool that he involved everyone that way. Although it was a tense time he did go out of his way to make everyone feel a part to it, even the new guy. By now, Billy’s next door neighbor, Urban Meyer and then Florida AD, Jeremy Foley were both present. Uncertainty seemed to fill the room. What was this going to mean for everyone? Larry Shyatt was the only one who I thought knew exactly what role he would play in all of this. Plus the chatter around the room involved the belief that Jeremy Foley would move quickly to hire Anthony Grant to replace Billy. Anthony was adored at Florida and was having great success at VCU. It made perfect sense. In the mix of all this upheaval Billy took the time to explain to me his intention to have me join him as a part of his staff in Orlando but that he could not specify in which capacity just yet. It was the first I had ever considered working in the NBA. I needed time to think but I came to Florida in large part to work for a coach who is destined to be a Hall of Famer so if he is promising a spot on his NBA staff, I have to go…right? Day #2, I have no idea what happened on this day. Or did the whole thing at Billy’s house take place on a Thursday? It really was a blur but I do know I spent time wondering what working in the NBA might be like. I took Billy at his word that I would have a job with the organization. So I wanted to know more but I also understood the whirlwind he was in so realized the need to be patient. I had spent Monday and Tuesday moving into my new office so do I start re-packing? Day #3 I’m pretty sure this was a Friday. 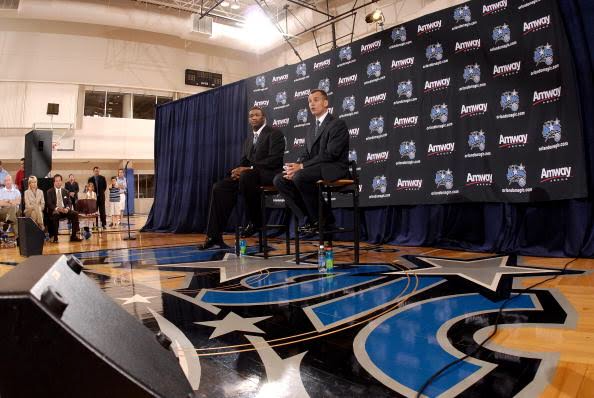 Billy heads to Orlando and is introduced as the new Head Coach of the Magic at an 11am press conference. Back to back NCAA titles, A brand new Arena with Dwight Howard as the centerpiece of a franchise on the rise. It all did make sense. I just didn’t know how I fit into that picture but there was something about watching Billy operate for the first time that made me feel like I could trust him in this situation. So I waited patiently. I’ve never had a strong desire to work in the NBA but like most coaches I’ve always been curious about what it would be like. I watched the press conference on TV like everyone else around the program. Seeing him on TV and listening to him, It just looked like a perfect fit and the most opportune time to make the jump. Another press conference was set for later that afternoon in Gainesville. This one was more for closure at Florida. Billy would be addressing the media and basically wrapping everything up. The venue was on campus right next door to the practice facility. While the media Session was taking place I received a call from Dave Leitao so I walked out into the parking lot where I could have some space to speak freely. Dave was checking to see how I was doing in the midst this whole whirlwind. He also took the time, in his way, to let me know that if I wanted to return to my job at Virginia that the opportunity to do so was there. He did this without pushing in the slightest. Dave is my man! Literally, as I was closing that conversation with Dave my phone rang so I pulled the phone away from my ear briefly to check the caller ID: “Anthony Grant”. The timing of the call didn’t require that I cut Dave short, I was able to finish with Dave just in time to answer Anthony’s call. Anthony is very economical with his words, a trait I admire in him. He is very concise and thoughtful. So, in his way, Anthony suggested that if I didn’t wish to return to Virginia or if I didn’t have a desire to coach at the NBA level that he would like for me to consider the possibility of staying at Florida. He said all of this without actually stating that he would be the coach at Florida. At this point I’m standing in the parking lot and Billy is still engaged with the press. I explained to Anthony that it meant a lot for him to reach out but with everything happening so quickly I just needed some time to process it all. What was really in my head though was, what was Billy going to do? I was beginning to warmup to the idea of coaching in the NBA and working with him. Press conference ends. I finally get a brief moment to chat with Billy and take his temperature. He affirms that he plans to bring me along and that he has some things to work out first and I’d need to continue to be patient but not to worry. So I tell him I’d like to get back home to my family while things shake out and we can talk when appropriate. Cool? Cool. Day #5 A great quality that Billy Donovan has is that no matter how intense a situation may be he can find humor in it. During this time I was deep into the TV series “24”. He’s not a TV show buff so I had been trying to describe the show to him and explaining how cold blooded the main character, Jack Bauer, was. He was amused but not interested. So now I haven’t heard from him since we last spoke at the end of the press conference. I’m simply relying on his word and, although I trust his intent, I’m anxious because now emotionally I’ve kind of started to move towards the idea of working in the NBA. That evening my wife and I were talking about everything with the TV on in the background but the sound off. I recall the TV being tuned to ESPN and a MLB game was on. As we were discussing our uncertain future a highlight of Billy Donovan flashed on the screen with “Breaking News”. I scrambled to get to the remote to see what was going on but by the time I turned the volume up it had gone to a commercial. As we waited for the telecast to return so we could find out what this Breaking News was about, my phone rang. Caller ID: “Billy Donovan”. Can’t front, I was slightly disappointed in that moment after spending the past two days accepting the fact that I could be working in the NBA. But ultimately I was relieved by the reality of a sure thing. I didn’t know much about the NBA and my main focus was making sure my family isn’t negatively effected by my career. I was going to the University of Florida which was my initial intent and I would be in an Elite program working with one of the very best to ever coach College Basketball. Not bad for a kid from the Eastside of Buffalo, NY. It was quite a whirlwind of emotion and although my NBA days were never actually official it all turned out to be a great experience. Rob Lanier is currently the Associate Head Coach at The University of Tennessee under Rick Barnes. Rob finished his playing career at St Bonaventure University in 1990 and began his career in coaching under Jack Armstrong at Niagara University that summer. In 1992 he moved on to his alma mater under Jim Baron for 5 seasons followed by stints at Rutgers and Texas (under Rick Barnes) before being named head coach at Siena College in 2001 where he led the Saints to two postseason appearances (2002 NCAA & 2003 NIT). After Siena Rob worked at Virginia under Dave Leitao, Florida under Billy Donovan before reuniting with Barnes at Texas in 2011. Rob is one of the finest men of character that I have ever been around. To a player he was a dream coach, to a coach he was a dream player. So thankful to have been a teammate of his back at SBU. Much respect to a great man. Great read Rob! I swear I always wanted to coach but always had that same worry about how that move would impact my household. Thanks for sharing! Great post! You must have made a real impression on Coach Donovan, telling him No because your job was not finished in Virginia, and then him offering you an opportunity to coach in the NBA. Thanks. Rob, so proud of the life you’ve made for you and your family. You by far were one of the nicest, respectable players I met while at Bonas. Congrats on your success, and what the future holds! My senior year in college after having 2 coaches in 3 years. Rob Lanier came in to be my 3rd coach in 4 years. With alot of unknowns and it being my final year. I had the mindset to disregard the coaching staff all together. Rob Lanier related with me on and off the court. His character and him being genuine helped me have one of the best seasons of my life and helped us win the conference tournament and an entry in the NCAA tournament in his very first year as being an head coach. Thanks for the memories coach. Thanks for sharing these memories. Really drove home the roller coaster ride of coaching. Congratulations on having the courage to ride the ride! All the best to you & your family! Great read Rob I know you have had many a tough decision’s to make in your career! I myself could never have made the moves you have as I always considered myself a classroom teacher 1st & foremost then the Bball court became my afternoon classroom! I do not ever regret staying put at the old LaSalle HS where I cherish every memory from both the classroom teaching Accounting, Business Law & Business Math and the basketball court! I respect all you have done and all the great things you did for one of our best ever at LaSalle Timmy “Fatjack” Winn. I will never forgot your great mentoring of Tim and the wonderful trips to St. Bonaventure to see him grow as a player and more importantly as a person! He has turned out to be a wonderful husband, father with a truly great family! Congrats Coach Pat Monti, Naples Fl currently a Mentor/Assoc. Coach at Gulf Coast HS after several seasons at Naples HS! Great read Rob. We are fortunate to have you here at Tennessee. I appreciate your friendship and respect the family man you are. Man, so cool reading this after hearing the shorter version the other day. Site looks great Rob, looking forward to more stories. Gr8 Men of character will always find each other whether it is to fail or succeed. No matter what; the character remains intact where failure ceases to exist…Success! This was a great read for a young up and coming coach! Really enjoyed it, thank you for sharing! great job coach love what your doing at The University of Tennessee!